Sitting on the boundary of an “ecological transition zone”, Dinosaur National Monument has incredible biodiversity. 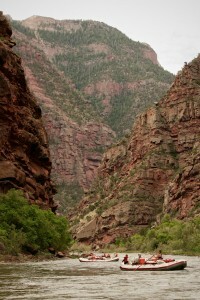 Due to its unique geography sitting at the top of the Colorado Plateau and the base of the Uinta Mountain rage, the upper Green River enjoys the best of both ecosystems. Towering Ponderosa and Lodge Pole Pines tower over lower-elevation willows and juniper while Big Horn Sheep sharing space with the elusive Mountain Goat. This landscape is nothing short of magical when seen through the eyes of a child or nature enthusiast. And lets be honest, enthusiast is a fancy word for NERD! 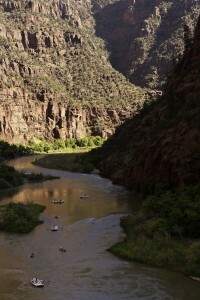 While stories of John Wesley Powell’s world renowned first boating expeditions span nearly the full length of the Green and Colorado River, no place has more infamous stories than Lodore. In 1869 Powell and his gang of ruffians were met with a near trip-ending catastrophe at aptly named “Disaster Falls”. 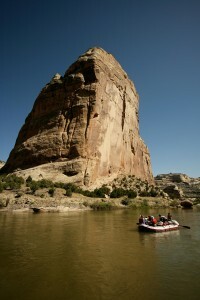 Powell describes this rapid as “a channel filled with dangerous rocks that break the waves into whirlpools and beat them into foam.” It was here that the No Name boat was to join the ghosts of the Green River. While they suffered no casualties the crew lost much of their food supplies and equipment. 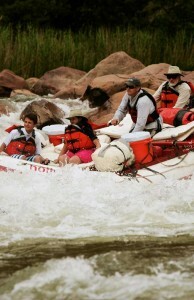 Lucky for you, Holiday River’s custom made rafts fare much better through these technical rapids. Come get all the adventure with none of the sacrifice. 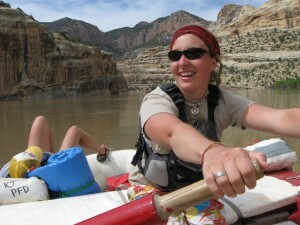 Deep in the heart of Dinosaur National Monument lies the confluence of the Green and Yampa rivers and below them a birthplace of a movement. In 1950 when the Secretary of the Interior approved the construction of the Echo Park Dam, calls to save this magical place were so far spread and successful that the nascent environmental movement had its first tangible win. While saving Echo Park meant damming Glen Canyon and creating the Grand Canyon we now know, it was the 1st time a call to protect wilderness had ever created a true popular movement in America. This impact is still felt in the ethic of many conservation groups to this day and the importance of an undammed river couldn’t be more apparent than on this trip. When people ask me where I live in the summer, I commonly answer “on the left bank in the middle of nowhere”. 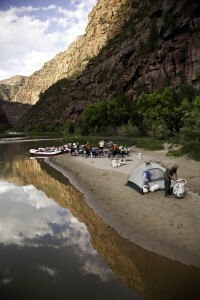 If I had to choose which bank I wanted to land on, most often I’d opt for the campsites in Lodore Canyon. They are a hallmark of pristine beaches and comfortable spots to cozy up for a night under the stars. Many beaches are large enough to play games such as horse-shoes or even beach volleyball. For family raft trips, there are some choice spots where I spent my youth engineering drip-sand castles in safe shallow beaches. Many of these camp sites have easily accessible hiking opportunities for those who didn’t get their fill of adventure in the rapids. In short; camping heaven. 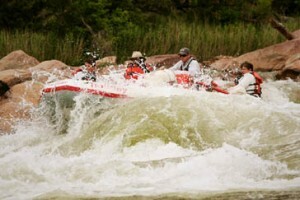 The Gates of Lodore river trip is commonly called the little sister to the Grand Canyon. This could be describing the similar rich history or numerous cultural sights but is most often referring to the massive geologic record found in its canyon walls. While the Gates of Lodore are made up of 1.1 billion year old quartzitic sandstone, by the last day of the trip you are floating amongst 34 million year old conglomerates. With each new rock formation comes a new chapter into the long-forgotten history of this unforgettable landscape. From protozoa to crinoids to dinosaurs these rocks can talk. When you are floating beneath such ancient walls, it can give you a deep sense of peace. These canyons have been here long before humans even existed as a species and would be there long after we are gone.